← WTF Wednesday: Who Says A Girl Can’t Be President? I was in a McDonald’s recently which is very unusual, because I definitely don’t eat anything they sell. But it was convenient and I needed to kill some time, so I nursed an iced coffee for a bit. The real treat turned out to be two men at a nearby table. They seemed interesting so I put on my eavesdropping ears and tuned right in to their conversation. The first topic was, what else, Trump v. Clinton. I was relieved to learn they are in Clinton’s corner. Then they started in on cabinet appointments. I don’t know if this is a uniquely Washington kind of conversation or if those outside the beltway analyze this stuff, but it’s fairly common here among a certain crowd. These guys did not seem typical for that crowd, but you never know. Anyway, they started debating the best cabinet appointment; what they would want if they were up for that kind of thing. Again, not unusual, except for the criteria. They were basing their decisions on which appointments would be the coolest but still require the least amount of work. Huh? That is definitely not a DC attitude. We are obsessed with working, love it, give me more, please pretty please. And a lot of people particularly relish the prestige of a high end presidential appointment. So, huh? They started with Attorney General, even while they speculated that you might have to be an attorney for that one, and apparently neither of them meet that particular criterion. But either way, too hard! Too much controversy, too much press to deal with, just too much work. Secretary of Defense? No way. No way in hell. Obviously lots of work, long hours, making big decisions that would require a lot of briefing. So, no. Then there are just obvious choices to avoid: Energy, Housing, Homeland Security, VA. Transportation is probably risky too because things are kind of a mess. Labor, Education? Interesting choices but again, too much work. Lots of regulations and things to keep up with, and who has time for all that? They decide that Treasury would definitely be too hard, and run through a few other possibilities, which they rule out for one reason or another. Hey, what about Secretary of State? That’s a good one. You get to travel a lot, meet interesting people, see the world for free! But, cautioned the other one, you have to travel. All the time. Frequently to places you really would prefer not to see or experience. So it’s not as good as it seems on the surface. Wait a minute…got it! 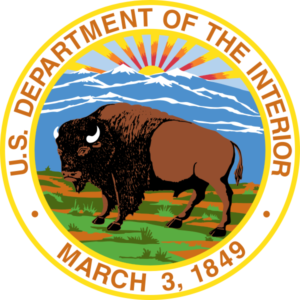 Secretary of the Interior! A stroke of brilliance. The only responsibility is national parks or something. Yes! The other guy speculated that under his watchful eye maybe they would add someone to Mt. Rushmore or something like that. You know, leave their mark. Fishing and hiking would basically be part of their job. Every day would be a vacation! I breathed a sigh of relief that they had settled on something because my coffee was empty and I was down to just ice chips. That’s why when they started in on whether they would add FDR or JFK to Mt. Rushmore, I had to let it go. I’m sure the legacy Presidents would be OK with it though. But now I’ve found a flaw in their plan. According to the reputable website www.dummies.com which as you can imagine I refer to quite a bit, the Secretary of the Interior is a mere seven heartbeats away from having to assume the presidency. It could happen you know, a bad case of a highly contagious flu or whatever? And then they’d be stuck holding the bag. And I feel pretty sure that being the president is hard work. What is the order of presidential succession? This entry was posted in Uncategorized and tagged 2016 Election, Business, Culture, Politics. Bookmark the permalink. What?!? The Secretary of the Interior has to go outside? That makes no sense at all – like a lot of things in our government. Guess I shouldn’t have been surprised. I know, crazy right? I wonder if there’s a cabinet position that involves watching lots of TV and sitting on the couch. Cause that’s the one for me! You picked a doozie conversation for eavesdropping, Jill. LOL!! I find their topic of conversation so interesting ~ it must be a DC thing. I’m pretty sure I’ve never overheard any conversation like that, anywhere. 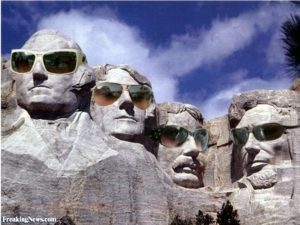 And yes, let’s get FDR up there on Mt Rushmore! I just got really lucky that day! And now I’ve decided I’d like to add Eleanor as well as Franklin. Cause that’s a big mountain, and why not? i’m glad homeland security is the last one, but I’d be happier if it was struck off all together. Of course your vote counts! And I am totally with you on FDR. I am glad to see the Homeland Security is last. Not the people I want running the country. At first I thought of kitchen cabinet appointments like door pulls…I am so far out in left field that I am probably on a basketball court. You eavesdrop on a higher grade of conversations than I do. I want to be in whatever field you’re in!! And yes, my eavesdropping skills are pretty legendary. Every once in a while I get lucky and overhear perfect blog fodder. Let’s hope there are no epidemics. Oh wait! Those guys will never get a position anyway! I was encouraged by their political leanings though. Even being just seven heartbeats away from the presidency, I would still pick Secretary of the Interior hands down. If it looked like the six poor souls preceding me were going to bite the dust, I’d grab a backpack and get well lost in one of “my” national parks, never to be found. Hmmm. A job that requires outdoor activity is pretty much my worst nightmare. Is there a cabinet position for someone who knows everything about all the Real Housewives? Cause that would be the right one for me!